Een milde bad- en douchegel met Dode Zee mineralen en heilzame kruidenextracten. De Mineral Body Wash reinigt, kalmeert en verzacht de gevoelige, (zeer) droge, rode en geprikkelde huid. Voor een frisse en schone huid, die in balans is. Schudden voor gebruik. De huid wassen en afspoelen. 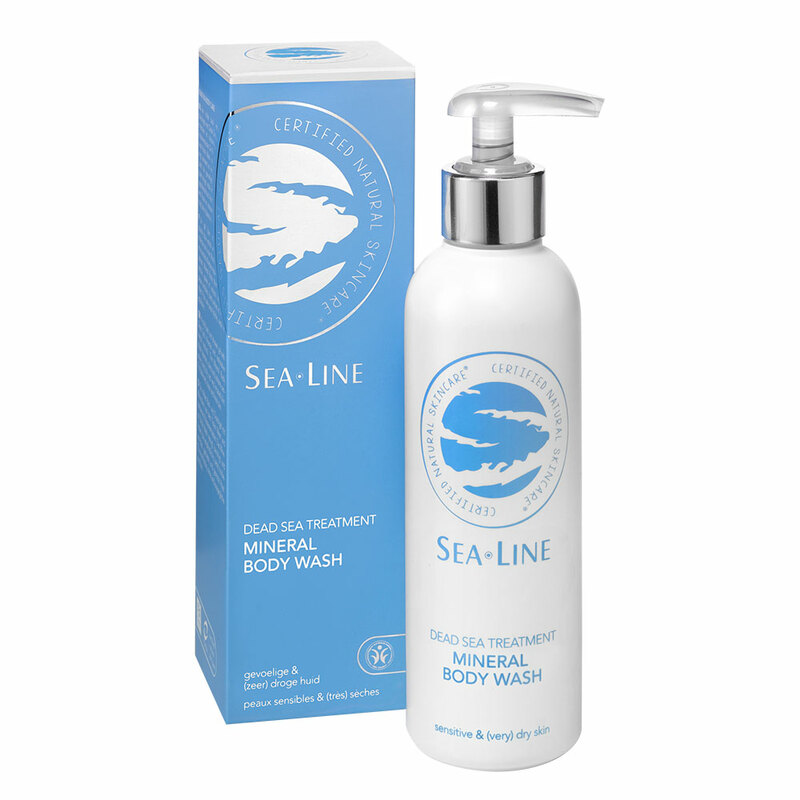 Voor een optimaal resultaat na gebruik de Sea Line Mineral Face & Body Treatment of Mineral Body Butter aanbrengen. Aqua (Water), Rosa Damascena Flower Water**, Glycerin, Coco-Glucoside, Decyl Glucoside, Alcohol, Sodium Cocoyl Glutamate, Disodium Cocoyl Glutamate, Citric Acid, Xanthan Gum, Caprylyl/Capryl Wheat Bran/Straw Glycosides, Betaine, Fragrance Natural (Parfum), Lactic Acid, Sodium Levulinate, Polyglyceryl-5 Oleate, Levulinic Acid, Chondrus Crispus Powder, Sodium Anisate, Fusel Wheat Bran/Straw Glycosides, Simmondsia Chinensis Seed Oil**, Echinacea Purpurea Extract**, Chamomilla Recutita Flower Extract**, Equisetum Arvense Leaf Extract**, Citrus Aurantium Dulcis Peel Oil, Thuja Orientalis Extract, Calendula Officinalis Flower Extract**, Juniperus Mexicana Oil, Macadamia Integrifolia Seed Oil**, Phytic Acid, Pogostemon Cablin Oil, Glyceryl Caprylate, Salix Alba Bark Extract**, Leptospermum Scoparium Branch/Leaf Oil, Lavandula Hybrida Oil, Dead Sea Salt, Daucus Carota Sativa Root Extract**, Rosmarinus Officinalis Leaf Extract**, Citral*, Limonene*, Linalool*.